The series of "Harry Potter" fantasy books was the inspiration for the naming of a new insect discovered by NDSU researchers. The species of stink bug was named "Thestral incognitus," after the imaginary thestrals created by author J.K. Rowling. 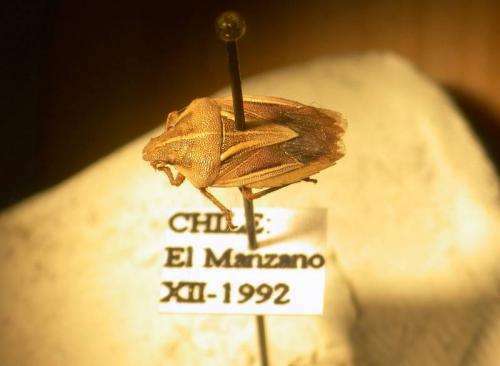 NDSU doctoral student Eduardo Faundez and David Rider, professor in the School of Natural Resource Sciences, reported their discovery in the article, "Thestral incognitus, a new genus and species of Pentatomidae from Chile," recently published in the Zootaxa journal. According to Faundez, the research was a long-term project that involved a trip to the Smithsonian Institution insect collection funded by the Knipling Thesis Enhancement Award from the NDSU entomology department. The new species will be included in his dissertation. Rowling's thestrals are a breed of winged horses with skeletal bodies, which often cannot be seen. The ivory carinae of the stink bug and calluses on its dorsum are similar to that skeletal structure. "The reason for this special name is because the specimens of this new genus come from localities that have been fairly well collected. Yet, we believe that they are hard to find and not all people can see them, much like Rowling's creations," said Faundez, "Additionally, the bugs have some bone-like ridges in their bodies that resemble the skeletal bodies of thestrals." Identifying, describing and naming new stink bugs, or Pentatomidae, is the main focus of Rider's work. Rider, who is Faudez' faculty adviser, said, "Eduardo is doing a tremendous job. He has probably published between five and 10 papers in the past year, some of which are on other insect groups." Rider said about 1 million species of insects have been described, but estimates indicate there are about 10 million species yet to be identified and named. Researchers have barely scratched the surface. Naming new species can take many tracks. Some are named for their color or shape, others honor a researcher for their work and still others are named for the location they were found. But, sometimes a bug deserves something truly distinctive. "This all can get a little tedious, and so now and again, it is kind of fun to come up with a different name that still has some pertinence," Rider said. So, Faundez decided on the reference to thestrals. He notes that it's not uncommon to give unusual names: a beetle called Agathidium vaderi is named after Star Wars' Darth Vader and a fungus, Spongiforma squarepantsii, is named in honor of the SpongeBob SquarePants cartoon. In addition, the "Harry Potter" series already has a wasp (Ampulex dementor), spider (Aname aragog) and dinosaur (Dracorex howartsia) named after characters. "A reason for choosing this kind of name is that it makes people get interested and learn about the species," Faundez explained. "People are aware of it, and consequently that helps us to get new data. This is important because the work is just starting with this new species."